Homo sapiens or humans evolved in Africa about 200,000 years ago, reaching modernity about 50,000 years ago. Prior to the arrival of humans in Europe, the Middle East and Asia, these places were inhabited by another species of hominoid, Homo heidelbergensis or Neanderthals. Neanderthals begin to show on the archaeological record at around 400,000 years ago and became extinct at about 35,000 years ago with the arrival of humans. Humans are so adaptable we have migrated to almost every part of the world and in the process forced the extinction of all other species of hominoids. We are the only species of hominoid left. 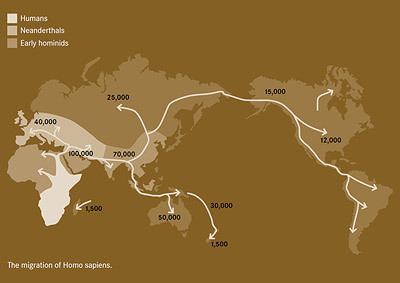 About 180,000 years ago humans successfully migrated out of Africa. By about 50,000 years ago we were already beginning to diverge into distinct populations. Our species evolved in Africa 200,000 years ago. The Genographic Project has found that people spread out of Africa in at least two migratory waves. The first wave travelled from eastern Africa into the area of the east coast of the Mediterranean known as the Levant about 80,000 years ago. The later second wave moved from Africa into the Arabian Peninsula and continued eastward following the coast of South Asia about 50,000 years ago. This southern wave kept rolling along reaching Southeast Asia, where one branch of people migrated to Australia and New Guinea, while other branches moved along the coast of east Asia. A branch of this second wave migration moved north, into the central Asia and spread west into Europe and east into Siberia about 40,000 years ago. Eventually humans made their way to the American continent about 20,000 years ago. The actual timing of the southern wave of humans is hard to ascertain because it appears to have moved along the coast, where after the end of the last Ice Age 12,000 years ago the melting glaciers drowned large stretches of coastline so the evidence is now under the ocean. The fossils we have of these migrants offer few clues as to what sparked their spread. Migration to the Australian continent for these travellers was a difficult task. Australia is separated from Southeast Asia by a great expanse of water. 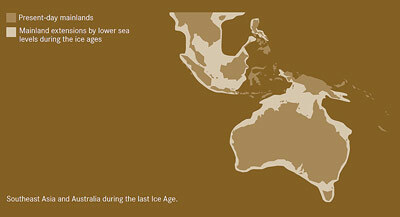 During the last Ice Age, the distance was smaller because so much water was frozen in glaciers. 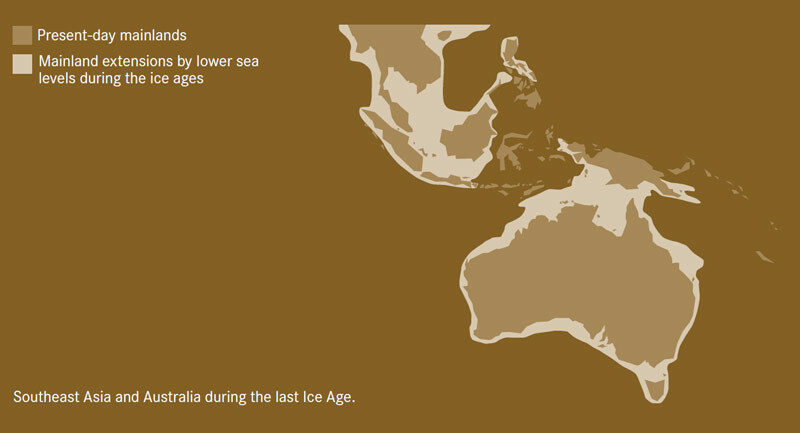 But before 50,000 years ago humans would still have faced a voyage across fifty miles of open sea to get to Australia. They must have built sea craft strong enough to survive the voyage, a technological feat that went beyond making spears or lighting fires. 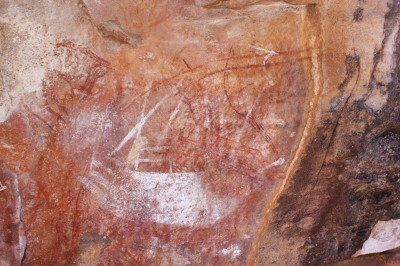 The first Aboriginal people arrived on the north west coast of Australia between 65,000 and 40,000 years ago. The archaeological evidence suggests that Aboriginal people had contact with Macassans and the people of southern Indonesia for the past two thousand years exchanging ideas, technology and culture. Aboriginal people eventually populated the entire continent of Australia developing a subsistence economy hunting birds, fish and animals and harvesting edible plants. A basic dugout canoe constructed in an ancient and universal style called the ‘5 part canoe’. This hand axe was found in 1931 by Louis Leakey in the Olduvai Gorge in Tanzania, and is dated to about 1.2 million years ago.